It's a sign of the Apocalypse, I tell you. The end is coming. Mag Instrument are going to be making LED flashlights. LED lamps are not what you'd call a new development in the portable lighting industry, unless the scale of your technological timeline is such that there's not a whole lot of space between the fire drill and Lego. But Mag Instrument, the world's biggest flashlight brand (there's probably some factory in Ningbo that makes 50 times as many lights, but nobody knows their name), take things slowly. There's no reason to suppose that Mag's LED lights will be particularly remarkable, but they'll probably be as tough as all of the non-bulb parts of current Maglites (the Ningbo company's lights probably wouldn't pass that run-over-by-a-truck test), and reasonably priced (provided you don't even contemplate paying the list price...). When Mag finally get around to selling their LED models, though, a whole small industry is going to have a problem. The absence of LED Mags, you see, has created a market for LED upgrades for the enormous number of old Mags that're bouncing around in the world's cars, toolboxes and backpacks. The upgrade lamps are generally a bit pricey, partly because of small production runs and partly because high powered LEDs are far more expensive than similarly bright incandescent globes. Retrofit LED lamps also, often, don't work with the standard Mag twist-the-end beam angle control system - see the Terralux DA-5W and Elektro Lumens Tesla-6 for extreme examples. But they let you get prettier, longer-lasting LED light (that's longer in useful battery life as well as much longer in bulb life) in into a Mag body, and so they're deservedly popular. When you can buy a new LED Mag over the counter for - I presume - rather less than the price of an incandescent Mag and an LED lamp, though, the market for the lamps is going to go south fast. This is a bit of a shame, because some people have gone to great lengths to make really cool retrofit lamps for Mag-Lites. Like this one, for instance. It's the Terralux MaxStar2N, it sells for $US49.99, and it looks really peculiar. The reason for that is that the MaxStar doesn't have any LEDs that point forward. 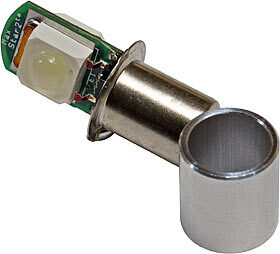 It's a little circuit board nestled in a standard flange lamp base (the separate cylindrical metal thing is a collar that helps it keep cool in a Mag lamp fitting), and on either side of that board is a Nichia Jupiter Series one-watt white LED. Nichia, thanks in large part to the efforts of the rich and prosperous Shuji Nakamura, was the biggest name in LEDs - for a little while. Nakamura-san came up with the blue LED, and then came white LEDs, which are blues with a yellow phosphor coating over the top. Then Lumileds came along with their one-watt-and-higher Luxeon LEDs, which shot them to prominence in the LED flashlight market. Suddenly normal-sized flashlights with only one LED could compete with ordinary cheap incandescent-globe units; you didn't need a honeycomb of 5mm LEDs to get a decent amount of light. 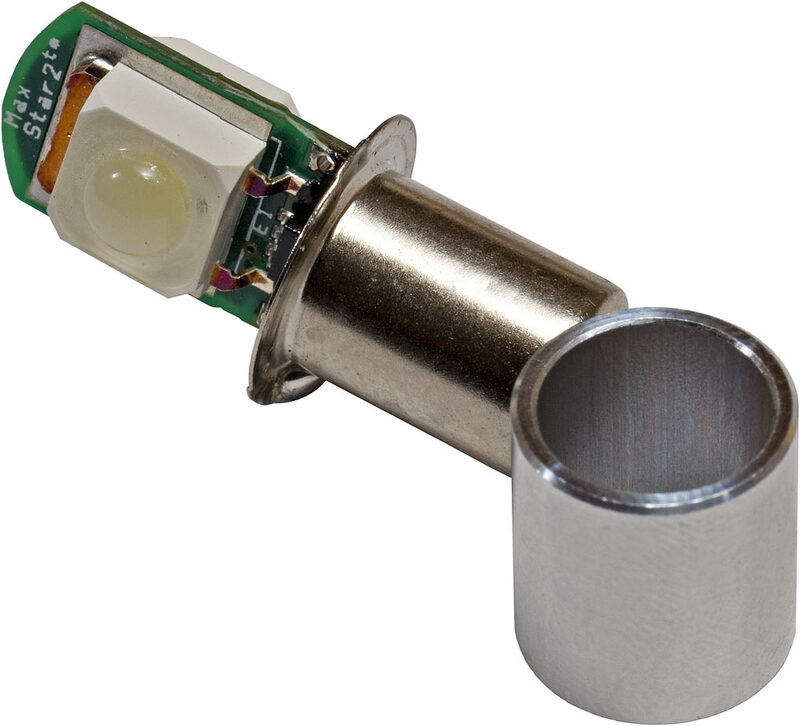 Nichia, of course, were soon making their own super-LEDs (as were the other big names), and it's a couple of their surface-mount Jupiters that adorn the MaxStar. The super-LEDs, like other current blue and white models, want something like three and a half volts. 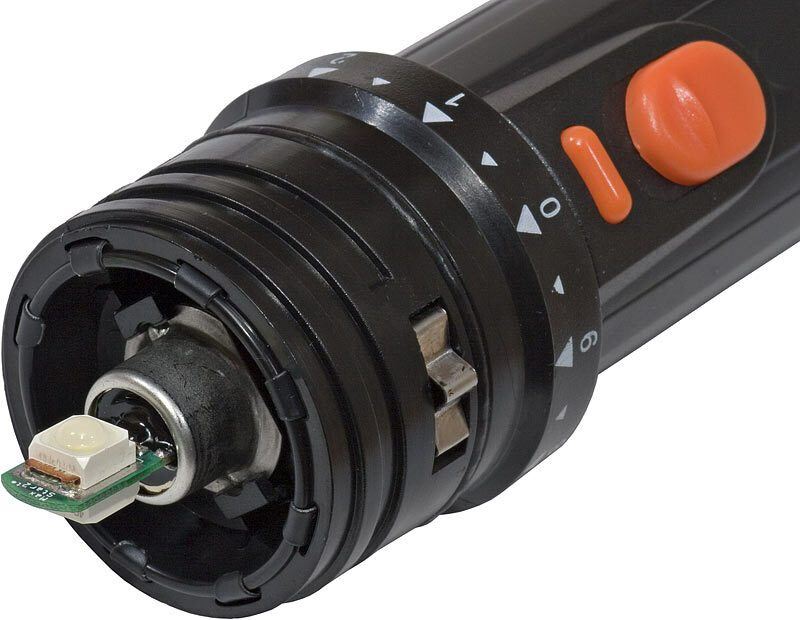 But they're backed by a (tiny) voltage regulator that lets them run from a flashlight containing two, three or four cells - a nominal 3 to 6 volt input range. The MaxStar will work from two-point-something volts, so a two cell light with 1.2V-nominal rechargeable batteries in it won't be useless. But if you're going for NiCd or NiMH power, a three or four cell light is a better idea. Actually, you could use five rechargeable cells and not exceed the six volt ceiling, but since you get a bit more than the nominal 1.2 volts per cell from fully charged rechargeables, and someone might absent-mindedly put ordinary batteries in the light, sticking with the two-to-four-cell limit is wise. I have, of course, not yet answered the big question. That question is: Why the heck does this lamp have LEDs that point sideways? 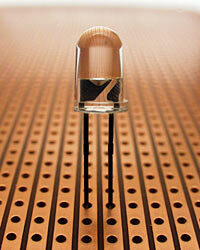 Most retrofit LED lamps have forward-facing LEDs. Duh. The problem with this idea is that the only way to focus the beam from a forward-facing LED is with a lens in front of it. There's nothing wrong with that approach at all. Some excellent flashlights work this way, and many LED lights have no special optics at all; they use the standard lens moulded into the top of the LED to give a perfectly good fixed wide beam, which is what most people want from a flashlight most of the time. 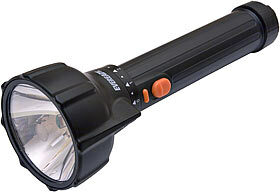 But forward-facing LEDs in an ordinary focusable flashlight means the focus function won't work any more. Ordinary flashlights have reflectors, which work because normal incandescent bulbs throw light more or less evenly all around themselves, except for the opaque metal shank. Some little flashlight bulbs have a lens cast right into the top of the bulb, to give some kind of beam focus in a light that can't have much of a reflector, but most flashlight bulbs have the same kind of all-around output as a household light bulb. 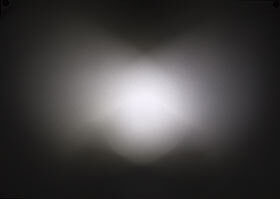 Reflectors can only focus the light that hits them, which is why it's just plain impossible to get a real searchlight beam out of a conventional flashlight. But they work pretty well. In Physics Experiment Land, a light source at the focus of a parabolic mirror gives a very nicely tight output. 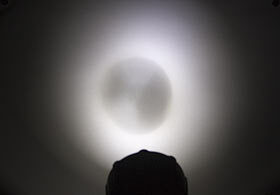 In the real world, the light source isn't a point, the glass envelope around it distorts the output, and the plastic reflectors used by most flashlights aren't the right shape or evenly reflective. But they're still close enough for government work. But not with a forward-facing LED. ...and one 5mm LED, even brutally overdriven, will only ever give you penlight brightness. Hence, the MaxStar2N's peculiar layout. It throws light out in two butterfly-wing cones, like a lighthouse, rather than the sphere-with-a-cone-cut-out-of-the-back from a normal bulb. But the lighthouse layout still works OK with reflectors. Actually, the MaxStar has the potential to work a bit better than a regular bulb if you want a tight beam, since it throws less unfocussed light forwards. So that's why the MaxStar looks weird. Is, however, all this a moot point now that LED Mags are coming along? Happily (particularly for all of you who are, as usual, patiently waiting for me to start writing an actual review of something), no. The MaxStar2N has a standard "PR"-type flange fitting (in bulb specifications, the number after the PR indicates the voltage; "PR 2" is 2.4 volts and "PR 12" is 6 volts, for instance. All of the standard full-sized Mags use flange bulbs, and they're used in umpteen other lights as well. So, in theory at least, this lamp should work in pretty much any flashlight. It's already been checked out very well in a Mag, anyway, so I procured a three-D-cell "Eveready Focus" flashlight instead. The Focus is a product of which Eveready/Energizer are so proud that, as far as I can tell, they don't mention it on their Web site. I couldn't even find it among the superseded products on the datasheet sub-site. The MaxStar fit into it just fine, though. ...because the Focus not only has adjustable, um, focus, but also has a reflector you could use to send signals to aliens. Apart from the big reflector, this is a very straightforward light. Its body's made from simple rolled aluminium sheet (which means lousy threads on the tailcap end, but they work), there are separate momentary and continuous switches, and there's a nice flip-out metal lanyard loop on the end. Actually, when looking at the Focus with the MaxStar installed but no reflector, it occurred to me that this'd make a good base for a somewhat chunky lightsaber. It's not as slick and shiny as a Graflex flash handle, but it'd only take a little painting (the orange buttons would have to go...) and greebling to make it a plausible chunky old-model saber. Another reason why I picked the Focus is that I'm a tightwad, and it only cost $AU15 (so the LED lamp retails for about 4.5 times as much as this flashlight). That lousy $AU15 even includes batteries - only three Eveready carbon-zinc ("dry") cells. But they're still D cells, and so not to be trifled with. Thanks to a lot of ads with little drumming rabbits in them, people buy a lot more alkaline these days than they need to. Alkaline has better capacity, of course, and also deals better with heavy loads, and it lasts longer on the shelf and is less likely to leak (dry cells are practically certain to leak, eventually, since their chemistry depends on the electrolyte eating the can of the battery). But for many applications, dry cells offer much better value for money. And brand name dry cells are pretty likely not to leak, as long as you don't forget about them for too many years, and they're not left loaded and therefore allowed to go dead flat. Oh, a related discovery: When testing an old "super heavy duty" 9V battery by the old lick-the-terminals method, do examine said terminals first to see if there's a crust of delicious dried electrolyte all over one of 'em. No, no, don't thank me. Just doing my job. Anyway, if you look at the spec sheets for a budget C alkaline cell (PDF here) and a super heavy duty D dry cell (PDF here), you'll see that they're near as dammit to being identical. Same capacity (a nominal eight amp-hours at 25mA), same performance at different load levels. But even if you're not suffering from Brand Name Disease and have figured out that the cheapest fresh batteries you can buy are the right ones to get, you'll still pay around half as much for carbon zinc Ds as you will for alkaline Cs. So, kids: If you're taking your shiny new nerd boom box to the beach and have tapped out your bank account just buying the thing, stock up on carbon zinc Ds to power it (and save up for rechargeables). The Ds powering this light were definitely enough to light the lamp as brightly as any three-cell light ever will. They were also working about as hard as any cells will have to when driving a MaxStar2N. Bench testing showed that this lamp has the same funny current to voltage relationship as various other regulated LEDs; down around 2.8 volts it draws something like 460 milliamps, rising to about 475mA at three volts, 630mA at 4.5 volts, and falling back to about half an amp at six volts. This means you can expect something in the order of 10 hours of service from three carbon zinc Ds before the flashlight starts getting dim. Alkaline Ds will last around a straight day, but you'd blooming well want them to, for the money. The current specs also indicate that a four cell light's the best thing to use the 2N in; it'll start out brighter and be gentler to the batteries until they're fairly flat, whereupon it'll beat them to death in quite short order. As usual for LED flashlight companies, Terralux claim enormous battery life for the MaxStar, and also as usual, they ought to put an asterisk after that. It's not a lie; this lamp really will give you much longer bright-and-useful run time than any incandescent bulb, and it'll last hilariously longer, too - actually, LED lamps generally never "burn out" at all, but just slowly get dimmer for a given voltage as the thousands of hours of run time roll by. But there's still a bit more to this. 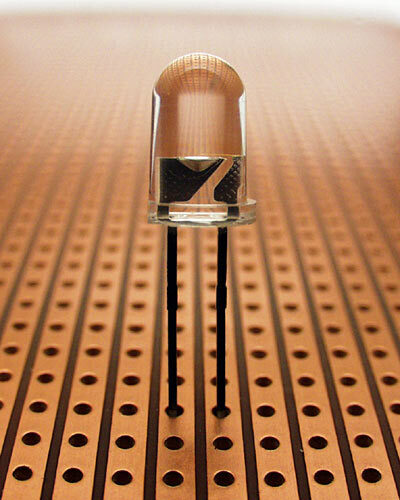 LED lamps work better than incandescent ones from low batteries, because their output spectrum doesn't slide down into invisible infrared as their input voltage falls. They're not magic, though; they still get dimmer when the batteries get low. Regulated lamps like the MaxStar hold up better as the batteries fade, but they do that by making the batteries work harder. If you want a flashlight with maximum low battery performance (emergency lights, poking around in caves...), you should get a simpler model with no fancy DC-to-DC circuitry. Even at maximum zoom, the beam was pretty wide. Actually, the first few focus steps (this flashlight has a very clicky focussing mechanism; it is not the light of choice for covert ops) change the shape of the beam more than they change its total coverage. Still, at one metre the brightest parts of the beam score a thoroughly acceptable 660 lux. This is not at all bad, for a vaguely rectangular beam that's around 20 degrees one way and around 35 degrees the other, with considerable further spill. The minimum brightness for the human eye to see colour is around one lux. This flashlight will manage that at a distance of around 25 metres, at which distance the beam will be about nine by 16 metres in size. The minimum brightness for the human eye to see anything is about 0.1 lux. That gets you out to around eighty metres with this flashlight. Focussing out until the dreaded (well, by flashlight fetishists at least) "hole in the middle" was obvious but not very dark gave me about a 40 degree wide circular beam, once again with plenty of spill. The forward light from an ordinary flashlight bulb fills the middle-hole somewhat, but only at close range. Even with its quirks, though, the MaxStar beam still looked much nicer than the beam from the stock globe. Even a weird LED lamp like this one gives a more even light than a cheap and lumpy incandescent, and the blue-white colour of LED light makes it easier to see things than yellow-white incandescent light of similar nominal brightness. The MaxStar2N is a funny looking thing, but it works well. I carried this odd cheap-light-with-an-expensive-bulb around for a few night walks and was perfectly happy with it. The lamp didn't burn up with prolonged use (a flashlight with a mainly-plastic bulb mount wouldn't be a good idea), it worked well enough with the focus function, and it does indeed give a perfectly good path-lighting beam, as well as enough throw to look at things at the tops of trees. If you're happy with a fixed wide beam and care about luminous efficiency, you want the absolute minimum optics between the LED and the world. Lenses eat some light, and reflectors definitely do; an ordinary household mirror only bounces back about 90% of the photons that hit it, and plastic flashlight reflectors definitely don't perform better. If you've got an old PR2-lamp flashlight that you'd like to update, though, the MaxStar2N looks to me like an excellent choice. Usefully bright but not so powerful as to eat batteries like popcorn, and two to four cell compatibility, so it'll work in an awful lot of household flashlights, even including six volt lantern-battery lights. The only problem is the price. Fifty US bucks is a lot to pay for a two watt bulb, when you can drop only $US40 (plus a somewhat higher shipping fee...) and get a superb product like Elektro Lumens' Blaster 3P. That's brighter, and focusable, and built like a tank. Mag will sell a lot of their LED lights simply because they're Mag, but I'm actually pretty doubtful about their products turning out to be any better than the Blasters. So if the light you're considering updating is a cheap and unremarkable product like the one I tried, the MaxStar doesn't make sense. If you've got genuine affection for your battered old Mag, though, or if you've got some other light which you'd be willing to defend as a classic if you for some reason wanted to sound like the most boring person in the world, the MaxStar will indeed give that light the new lease of life you're looking for. Review MaxStar2N kindly provided by Terralux.